They say that if you spot just one cockroach in your home, it means that there are many more lurking nearby. Whatever the story is, cockroaches are creepy, and spotting even just one single roach in your home or business is one too many. 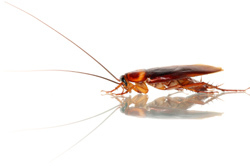 If you have spotted a cockroach in your home or business, or aren’t quite sure but you think you may have seen a roach, you’ll want to call in the roach extermination experts at Eco Tech soon. The sooner you eradicate your cockroach problem in your Minnesota home or business the better chance you have on keeping those nasty pests away. Roaches In Minnesota Are Built To Last! Cockroaches reproduce like crazy, and their eggs are not affected by insecticides. They are able to hide in tight spaces, sneak through the smallest of cracks, and are nocturnal. Quite simply, cockroaches are built to last, and this alone can make it difficult to control a cockroach problem. Between their repulsive appearance and their elusiveness, roaches also seem to be perfectly designed to drive humans crazy! The problem with roaches doesn’t stop with the creepiness factor. Cockroaches in Minnesota present a public health risk. If they come into contact with food, food preparation areas, and eating utensils, roaches may spread human pathogens like Salmonella and E. coli. Because cockroaches are attracted to food, if your home or business has a roach problem, it is important to keep all food covered at all times and maintain a spotless dining, food storage, and kitchen area. Cockroaches are hearty and sneaky, so the odds are stacked against the DIY cockroach exterminator. They’ll have you practically running in circles trying to stay on top of them. Once you think you’ve finally eradicated your roach problem, you’ll always wonder if you’ve really managed to get them all. Don’t allow roaches drive you crazy! The professional cockroach extermination techs at Eco Tech are experienced and trained in effective roach control methods. We have the proper equipment and the right materials to effectively control a roach problem in Minnesota. At Eco Tech, we specialize in safe, organic pest control. If the idea of using a less toxic, organic roach treatment appeals to you, then call us today at (763) 785-1414 to schedule your roach extermination appointment.